Greetings from the Windy City where I am this week on a business trip. Actually it's more like the very cold, wet, grey city this week. I tell you it's a shock to the system for this California girl. Nothing like going somewhere else to make you appreciate how nice things are at home. I'm dreaming of sunny California which actually is a bit silly since it's been pouring rain there this week! 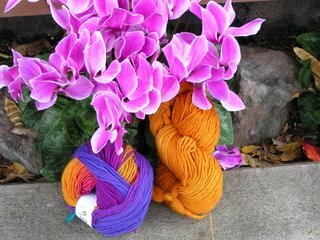 To brighten my day (and hopefully yours) here is a photo of yarn for - you guessed it - ANOTHER ballband bag. On Sunday we held my son's 4th birthday party at The Jungle in Saratoga and I can tell you there's no better place to let a pack of wild 4 year olds run off energy. Think hamster tubes for children . . . And it just so happens to be a mere 4 miles away from Knitting Arts - a yarn store I had heard about but never visited. So after the party Mom and I took a field trip. Poor Dad got dragged along but they have thought of everything - outside the store is a pleasant bench with a basket of magazines include Sports Illustrated and other such faire for the typical visitor to that bench! Well Mom found the Daiko yarn that Monica uses in the original ballband! I was so excited - I've not been able to find it so far so of course I was forced to pick some up. I think this will be more of a spring ballband given the colors but I'll post photos soon! And not to fear - I have three knitting projects with me for the trip even though I've only had about 3 hours total to knit while I've been here! Hope you are all staying warm and dry. P.S. I have heard from several of you who live in and around Chicago (and also every morning on the local news) that it was unseasonably warm when I was there. I do believe that and I appreciate the fact the days were in the 40's and not the 10's. After the first two days the sun did show itself. Since I was stuck in a windowless conference room all day I did appreciate the few times I got to take a break and walk around outside. Even though unseasonably warm, I can tell you after 10 minutes walking outside without a coat you were awake! Very refreshing. Sorry no visit with Lynae or trips to yarn stores as I had to work the whole time. Hope it stays warm there! I live in Chicago, and let me tell you, this is NOT cold for this time of year. Strangely grey, wet, and rainy, yes, but warm for December. Um, HELLO? I live in Chicago!!!! hrmph! I cannot believe you came here for a business trip and didn't let your Secret Pal know. Jodi is right...you think this is cold, you should have been here a week ago when it was 10 degrees! I love the colors of the yarn. Now if they could just attach the jungle gym with the yarn store, you'ld be all set! I love the colors of the yarn! It will make a GREAT ball band bag! I can't wait to see pictures.